Not every part of making loads of money is pleasant. You have to do things you don’t like, things that aren’t comfortable in your soul. 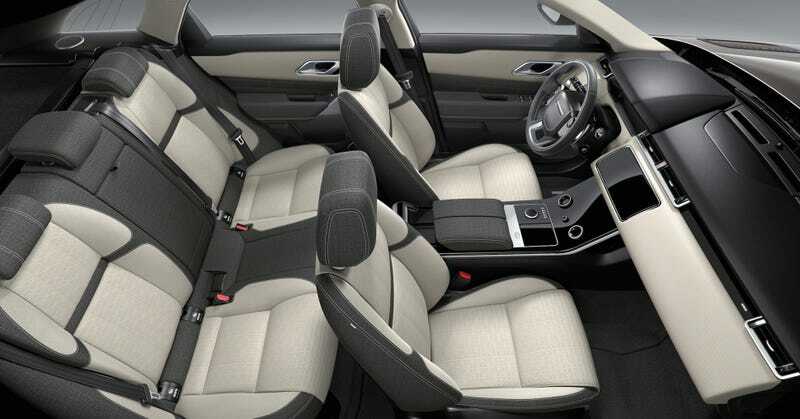 Take Land Rover’s design head, who thinks it’s a shame so many cows have to be killed for seat leather. But that’s just how the sad, sacrificial cookie that is capitalism crumbles. In this modern era of yoga and vegans and all of that, Land Rover design chief Gerry McGovern told Australia’s Drive the “attitude towards animal by-products is changing.” His coworker is a vegetarian, he said, and we can safely assume that one too many lunch conversations led him to this point of true realization. So, the company added new interior options to its 2018 Range Rover Velar SUV, which starts at $49,900 for the base model. Drive reports that the new interior options range from $920 to $4,210 above leather and vinyl-trimmed models, and that the animal-friendly interior is a wool blend with faux suede made from recycled plastic. Some features on the dash, Drive reports, are faux leather. The new style debuted a while back and we hear it’s quite comfortable, but McGovern just got around to talking about the reasoning behind it with Drive. See, McGovern just hates how many cows have to suffer in order to realize his design goals over at Range Rover. It’s such a bummer that lining his and Land Rover’s pockets has to happen like that, but someone has to make the sacrifice until the company can convince everyone that leather isn’t the only option. “That whole world of luxury is becoming more sophisticated and people are looking for ways to reconcile the way we use the world to create these products, things like fabrics that are more sustainable and have a better sustainable footprint. “Personally, I’d be quite happy to move away from leather tomorrow. I don’t like that we have to slaughter all those cows to create leather. But moving away from leather isn’t that easy, and McGovern told Drive that pricing a cloth trim above leather “was the subject of intense debate” internally since things like cow hides and real wood are so synonymous with luxury in this harsh, cruel world. Range Rover isn’t the first premium brand to offer a cruelty-free option in high-end cars. Tesla has won support from groups such as Peta for allowing customers to specify leather-free interiors, something BMW offers on the environmentally-friendly i3 electric car. Other brands including Mercedes-Benz have leather-free options available at special request. McGovern says a senior member of his design team is vegetarian, with a preference for leather-free goods. He says the brand should remain flexible in addressing growing demand for animal-friendly products. Maybe one day, we won’t have to burden these poor people with killing so many cows anymore. It really is a sad way to make gobs of cash, and it’s surely taking a toll on them.